Jerry Siegel and Joe Shuster were two teens from Cleveland who couldn't get anybody to buy their idea for a comic strip named Superman. No publishers wanted a story about an heroic alien who came to Earth from a dying world and pretended to be a meek newspaperman. Eventually, Siegel and Shuster stooped to selling their character's rights for $130 to National Comics, which quickly started making millions. 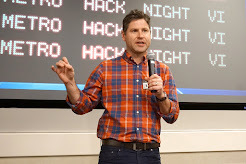 The duo never got the credit they deserved ... until the late 1970s, when public outcry after the success of the Christopher Reeve movie led to them finally each getting around $35,000 per month, medical benefits, and a "created by" credit from then on. 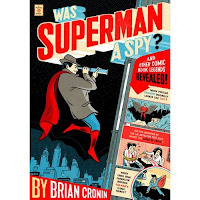 These are the kinds of stories that fill up Brian Cronin's new Was Superman a Spy? The book looks at dozens of little-known stories about the comic industry. I read the start and don't plan to go any further. But it seems interesting, and the sample I browsed ended on a tidbit about the Nazi SS's official newspaper, Das Schwarze Korps, decrying Superman for an episode in which the superhero swoops into Germany, gathers up Hitler, and throws him into a League of Nations trial court. 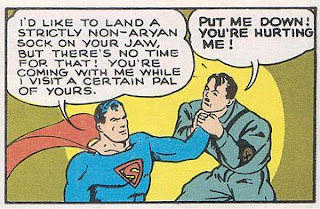 The Nazi article also claimed the character undermined the minds of the American youth, and predictably tossed around several unkind words about Superman's Jewish creators. Cronin concludes: "It's fascinating to see the Nazi propaganda machine so concerned with something so simple as a short superhero story."